I’ve never made whoopie pies before, and this was a successful and fun first attempt. I’ve always been intimidated by them, but it turns out that they aren’t too difficult at all! This recipe is frome Spache the Spatula, and now I’m sharing it with you! Preheat oven to 375 degrees. Line baking sheets with silicone baking mats or parchment paper; set aside. In a medium bowl, combine the flour, cocoa powder, baking soda, and salt; set aside. In the bowl of an electric mixer fitted with the paddle attachment, mix together the butter, shortening, and sugars for about 3 minutes until creamy and smooth. Add in the eggs and vanilla and mix for around 2 more minutes. Alternately add in the flour mixture and milk on low speed, beginning and ending with the flour. Scoop dough 2-inches apart onto prepared baking sheet in about a tablespoon-sized mound (I used a small cookie scoop.). Bake for 12 minutes or until the cookies spring back when lightly touched. Allow cookies to cool on baking sheet for 5-10minutes before transferring to a wire rack to cool completely. In a medium bowl, beat together the cream cheese, butter and confectioners’ sugar until smooth. Add in the pumpkin and spices and mic until smooth, scraping down the bowl as necessary. Spoon a tablespoon or two of filling between two sandwiches, and you’ve got a whoopie pie! I also considered rolling the edges in some halloween sprinkles, but it didn’t happen. Enjoy! 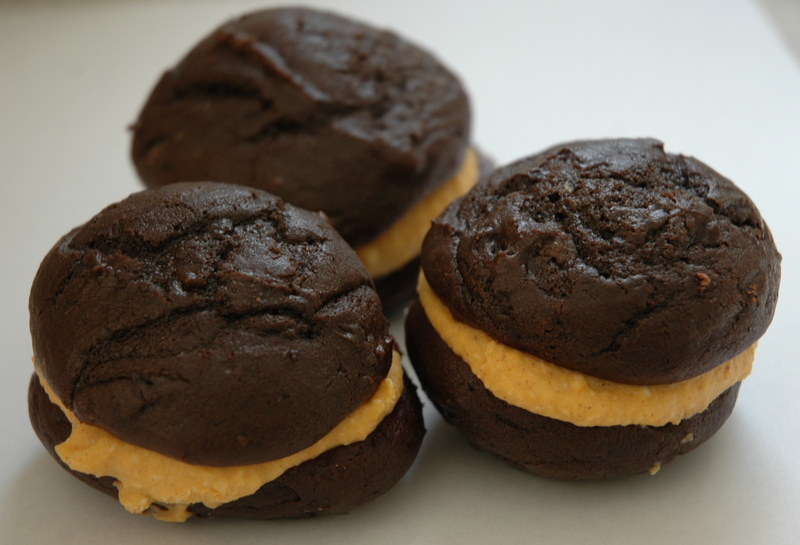 I just love whoopie pies and these are so adorable. This season we just love pumpkin filling, too. What a perfect recipe! Thanks for sharing!